There are some great characteristics shared by all LED strip light - bright light, small size, great flexibility, and easy customization. However, not all strip light is created equal and the variety of options and accessories can be daunting so we've prepared the following basics to help get you started so you get what's best for your project. The first choice is often selecting the right color and white isn't just white anymore. We feature three of the most popular white options, including: the ultra warm Sun Warm White, the subtle Champagne Warm White and the cool glow of Pure White. In addition, we also carry RGB strip light capable of 16 preset colors with brightness control, and 4 different pre-programmed effects, complete with speed control. LED surface mounted diodes, or SMDs, are what actually emit the light from the strip and two of the more common sizes are the smaller 3528 diodes and the larger 5050 diodes. The 5050 diodes emit up to 250 lumens of light per foot and are great for display and task lighting like bookcase lights, under cabinet lights or accent lighting placed behind crown molding. The smaller 3528 diodes emit a very capable 110 lumens per foot and are perfect for scenarios when you want accent lighting but may not need the light to be capable of being super bright. Wintergreen Lighting strip light is dimmable, which means you can control the brightness to your liking, but if you want the option for maximum brightness when needed you should consider 5050 diodes. 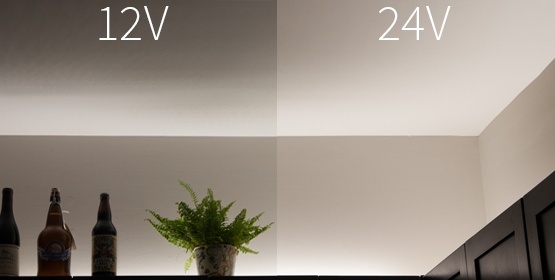 The final decision to make when choosing LED strip light is voltage. If you choose RGB instead of single color strip light, or if you need the brighter 5050 diode strip light, this decision has already been made for you as these larger diodes require the additional power of 24V. However, in the case of the smaller 3528 diode single color strip light you have options. 12V strip light has a longer max run length of 32' vs. a max run length of 20' for 24V. However, 24V strip light tends to cast a little more light, especially in longer runs, thanks to its additional power. Once you have decided on your color, diode, and voltage you are ready to determine just how much strip light you are going to need for your project. And then, once that is determined you can choose which power supply options best fit your needs. There are two key considerations when you choose a power supply: voltage type and wattage. Different types of strip light have different voltages and the power supply you purchase must have a matching voltage. 12V strip light requires a 12V power supply. 24V strip light requires a 24V power supply. The wattage you need from your power supply depends on two things: One, is the type of LED strip light you are using, and two, is how much strip light you plan to use. LED strip light has a specific power draw, which is measured in watts per foot. For each foot of strip light you plan to use, you will draw that much more wattage. You have to make sure that you have a power supply with enough watts to meet that need. To ensure the longest life for your power supply we recommend only using 80-90% of a power supply's total available watts. What can an LED Power Supply Run? Below is a chart of the recommended max length of LED strip light that you should power with each available power supply. Simply find the type of diode being used by your desired strip light along the top of the chart, and then go down the column to find the corresponding power supply that is capable of handling the length of strip light needed for your project. Projects requiring very long lengths of strip light may require more than one power supply. If you want to do the math yourself, the equation is pretty simple. Total watts needed = total feet of strip light needed times watts/ft drawn by the strip light divided by 0.8. For example: strip light with a 3528 diode draws 1.45 W/ft. If your project requires 20 ft of strip light, simply multiple 20 ft. x 1.45 W/ft and divide that by 0.8 to ensure you draw no more than 80% of the total watts of your power supply to maximize the power supply's life. Your result is 36.25 watts, which is too much for a 30 watt power supply, but perfect for a very capable 48 watt power supply. Project Scenario: "I am looking for under cabinet lighting to light up my counter space when I am cooking. I have white cabinets and would like a bright white light. I have 7 cabinets totaling 18' in length." Pure White 24V LED high output strip light with 5050 diodes for maximum workspace brightness but also dimmable for accent lighting when needed. Need to power 18' of strip light so purchasing the 20' spool would be ideal because the last two feet can be easily cut. One dimmer to control preferred brightness. Six single color interconnect cables (1 ft.) to connect the strip lights between the cabinets or to turn corners or bridge other gaps as needed. Project Scenario: "I want to add a little accent lighting to my kitchen. Maybe some nice warm cove lighting above my cabinets. I have 9 cabinets totaling 22' in length." Eight single color interconnect cables (1 ft.) to connect the strip lights between the cabinets or to turn corners or bridge other gaps as needed. Project Scenario: "I have a 12' x 10' room that is a little plain, and a little dark. I think I want to add some crown molding and thought this would be the perfect chance to add some cove lighting. I have 10' ceilings and want to put my cove lighting about 12" down the wall." Project Scenario: "I just finished hanging my new 55" TV on the wall and I want to do something to show it off. I was thinking of putting some lights behind the TV to create a really cool effect on the wall. I think the outline I want to make should need about 13' of lights." Project Scenario: "I have a very nice game room in my basement, and I want to create a special entrance. I was thinking of doing some stair lighting along the under edge of each step. I have 11 standard 7" rise and 11" run steps, and each step is 30" wide." Project Scenario: "I have a built in bookcase with 4 shelves where I display items I have collected in my travels. I would like to add some drama to the room and highlight these items with a little down lighting. Each shelf is 36" wide, 20" high, and 18" deep."